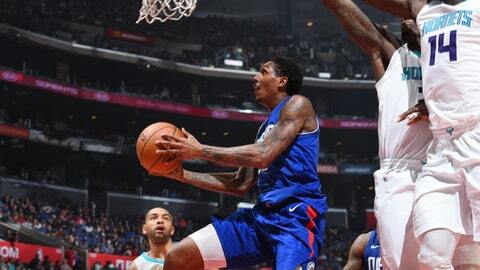 LOS ANGELES (AP) Clippers guard Lou Williams was trouble for the Charlotte Hornets from the moment he left the bench, making his first four shots, including three 3-pointers, and scoring 11 points before he was on the floor four minutes. Blake Griffin added 25 points in his second game back after missing 14 with a left MCL strain. DeAndre Jordan grabbed 15 rebounds to help the Clippers win their fifth in a row at home. The biggest surprise was Jordan, a career 44 percent free throw shooter, going 6 for 6 from the foul line. Kemba Walker scored 30 points for the Hornets. They fell to 3-13 on the road. Frank Kaminsky added 16 points and Dwight Howard had 10 rebounds for Charlotte, but was 1 for 9 from the field and had only four points. The Clippers led 100-92 before Walker made back-to-back 3-pointers to pull Charlotte ton 102-98 with 49 seconds left. Griffin made two free throws with 43 seconds remaining, and Nicolas Batum missed a 3-pointer. Down by 14 points in the second quarter, the Clippers regained control by outscoring Charlotte 27-9, taking a 69-61 lead on a driving layup by Juwan Evans with 1:30 left in the third quarter. Griffin scored 12 points during the stretch. Austin Rivers, who left Friday night’s game against the Lakers on crutches, sat out against the Hornets with a sore right Achilles tendon. Results of an MRI taken Saturday revealed no soft tissue injury or structural damage. Coach Doc Rivers said Austin ”could play” in the Clippers’ next game Tuesday night against Memphis. The Hornets went against the Clippers coming off their best performance of the season, a surprise 111-100 road victory two nights earlier over the Golden State Warriors, only their third road victory of the season. Hornets: With the second unit leading the way, Charlotte outscored the Clippers 28-7 over the first 10 minutes of the second quarter, turning a 29-22 first-quarter deficit into a 50-36 lead on Walker’s 15-footer with 1:56 left in the half. 42 halftime lead. The Hornets held the Clippers to 2-of-15 from the field during the stretch. Clippers: After a dismal second quarter, the Clippers got back in the game by holding Charlotte to a single field goal over the first 6:18 of the third quarter, and continuing on a 27-9 run for a 69-61 lead. Their offensive highlight came with 6:40 left in the third quarter when Blake Griffin broke free for a driving, right-handed dunk that brought the crowd to its feet. Hornets: At Sacramento on Tuesday night. Clippers: Host Memphis on Tuesday night.